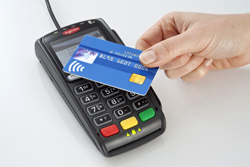 Ingenico has announced the launch of its new iPP300 line of contactless-compliant PIN pads. The iPP320 (monochrome screen) and iPP350 (color screen) PIN pads are designed to manage hundreds of thousands of transactions every day with numerous payment card formats, including credit cards, debit cards, loyalty cards, electronic purses, contactless cards and more, says Ingenico. Both PIN pads feature a magnetic stripe card reader, an EMV smart card reader, and MasterCard PayPass and Visa PayWave-approved integrated contactless technology. According to Ingenico, the devices can be connected to any type of payment system via a RS232, USB and Ethernet/IP serial ports, making them compatible with all types of connection required for the retail market. In tandem with the iPP300 deployment, Ingenico has also developed Axis, a multi-channel transaction platform designed to meet the payment requirements of larger retailers, including supermarkets, specialty chains, restaurants, theme parks, etc. According to Ingenico, Axis centralizes the entire transaction life cycle by providing real time reporting of transactions and optimizing the connectivity time frame for payment authorization requests.